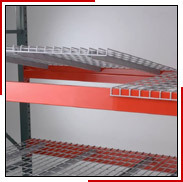 Should you use Wire Decks in your Pallet Rack? I had a call from a customer today with questions about wire decking. There are a number of reasons to use decking in pallet rack installations. First, there are National Fire Codes which severely limit the use of wood in racking. Solid decks will not allow the water from fire sprinklers, or fire hoses to flow down th the floor level, the most likely location for a fire. Wood also outgasses toxic fumes that are hazardous. Wood decking is allowed if you add a sprinkler to every level. Believe me, it will be much more economical to add wire decks. There is also an increased risk of injury with wood decks, particularly in areas where product is pulled by hand from rack. The best reason to use decking is safety. If a forklift operator is trying to place a pallet on a rack shelf level at 18′, his vision has to be very good to place the load correctly with the pallet weight distributed over the front and back beams. If he misses, the pallet can fall, and that can cause serious injuries or worse. The wire decking is designed to handle the weight of the pallet, so if a load is not correctly placed, the pallet will not fall. Wire decks also allow light to filter through to ground level. An operation with wire decks will also be cleaner, since dust will fall through the decks to the ground, where it can be collected. We get a few dozen calls every year from frantic customers that have gotten notice from the local fire marshall that the wood must be removed from the racking system. Then, there is a furious rush to replace all the wood, which means every pallet in the place has to be moved at least once. So, it makes sense to use wire from the start and to have a safer, cleaner and more illuminated work space. Thanks to Nashville Wire for the picture.